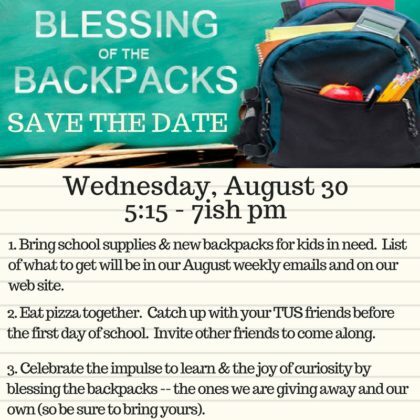 As a new school year begins, The Unitarian Society (TUS) invites community members to join in a “Blessing of the Backpacks” to kick off the school year. The special service will be held at TUS on August 30 at 5:15 at 176 Tices Lane, East Brunswick. A pizza dinner will follow. Students, parents, and anyone looking for a fresh start in their work are encouraged to bring backpacks, briefcases, and laptop bags to be blessed in honor of a new year of learning and teaching and the impulse for an open mind and open heart. Learn more on the Facebook Event page: http://bit.ly/TUSBOTB. For more information, visit http://www.unitariansociety.org, e-mail uutus@comcast.net or call (732) 246-3113.